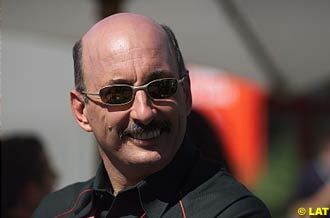 It can't be easy being Bobby Rahal at the moment. The former CART and Indy 500 champion took over as CEO of Jaguar Racing in December last year, and just over three months later he was in Australia for the opening round of the 2001 championship, already painfully aware that in relative terms, compared to most of their mid-field rivals, his team was not in good shape. The new team boss has to walk something of a tightrope this season. After all the hype that raised expectations to unrealistic levels last year, this season he needs to keep expectations under control, whilst still maintaining the positive attitude expected of racing people. Those first three days of the new season at Albert Park told the story. During qualifying, the Jaguars finished in twelfth and twenty-first positions, down from the seventh and twentieth positions achieved last year, although Luciano Burti suffered from a rear suspension failure that caused him to crash heavily. The race saw both cars finish, although the reliability issues, which so dogged the team last year, were still much in evidence. Eddie Irvine was forced into the spare car after the power steering on his race car failed, and he was then slowed by a fuel pressure problem, which required an additional pitstop for fuel late in the race. The team's only real highlight was in getting Burti to the finish line in eighth position - the first Michelin-shod car home. But, no matter how hard you look at all the statistics from the Melbourne race, it's hard to see much evidence that, in terms of on-track performance, the team has made much progress. In fairness to Rahal, it's hardly any fault of his. When his appointment was announced at Indianapolis last year, the American was clear about the size of the challenge confronting him. Speaking to the F1 press, Rahal said: "My task is to work with the various components within the organisation, to assist into turning it into a winning team, because I can't do it by myself. This has to be a team effort, and my job is to create that team with the help of the many people that are already there." "Believe me, I have no illusions about the immensity of this task," Rahal continued. "Irrespective of whether I have had Formula One experience in the last couple of years or not, this is a huge task, and I am ready to take on this challenge. Eddie (Irvine) has proven that he is capable of winning races, and it's my job to help him do so in the future." Rahal's comments were those expected from a 'new boy' about to move to Europe and into a world that was going to be very new to him, despite all his previous racing experience. Rahal, although still not officially a member of the Jaguar team, attended the races at Indianapolis, Japan and Malaysia - the final three events of the 2000 season. He looked and learned and didn't entirely like what he saw. Soon after he set up his office at Jaguar's Milton Keynes headquarters, Rahal oversaw a wholesale clean out of the team's technical staff, including their high-profile former Jordan designer Gary Anderson. In Anderson's place came ex-McLaren designer and engineer Steve Nichols. "There was," Rahal told Atlas F1 in Australia, "A culture of blame, in the management style of the previous technical team. I just felt that from a technical standpoint, we needed a change of vision. There were a lot of things that were done in the course of last year that frankly you have to wonder just what people were thinking about. There was a Herculean effort put in by a lot of people last year, and yet you didn't see a whole lot gained by it. "There was very little accountability for one's actions, and you are never going to get anywhere if that's the way you are," said Rahal forcefully. "I wanted people who are ready to stand up and be counted, and it takes fortitude to do that, because some days you are going to make the wrong call, but you have to give people the opportunity to make mistakes. I think that if there was one clear frustration within the team, it was that most people didn't think that they were being empowered to do their jobs." Rahal knows full well that most of the changes he has already made will not lead to a quick fix of Jaguar's problems. Plans are well in hand for improving the technical infrastructure of the team, but they are going to take quite a while to show up in improved performance on the track. Until then, there are going to be quite a number of difficult days and frustrating races. Now, of course, Rahal has a new boss in Niki Lauda, the three-times World Champion and former chairman of Lauda Air - the airline he founded some fifteen years ago. The always high-profile Lauda was much in evidence in the Melbourne Paddock, but already there is much speculation about just how smooth the relationship will be between these two strong willed ex-racers. With Lauda's recent appointment, the management structure of the Ford F1 Racing programme has finally been completed, and hopefully for the team, will remain stable into the foreseeable future. Dr Wolfgang Reitzle is the Chairman of the Premier Automotive Group, and Niki Lauda, as CEO of the newly formed Premier Performance Division (PPD), reports to him on all racing matters. Lauda is responsible for the three companies under the PPD banner, which are: Jaguar Racing, Cosworth Racing, and PI Research. Lauda's job is to ensure that all three companies work well together and totally integrate their racing programmes. Much of Jaguar's current troubles can be traced directly back to not only mistakes made under the previous ownership of Jackie Stewart, but by the almost constant changes in the senior management since the announcement of the buyout by the Ford Motor Company of the Stewart-Ford outfit over the Canadian Grand Prix weekend, back in 1999. One prime example of this muddled thinking has been in the choice of drivers when the need to replace Rubens Barrichello became apparent after the Brazilian decided to join Ferrari, just prior to the '99 Italian Grand Prix. The choice of Eddie Irvine might have made some sense then - he was winning races at Ferrari, albeit in Michael Schumacher's absence, and Ford wanted a 'name' driver to lead the team. The retention of Johnny Herbert for the 2000 season gave them some continuity, and Herbert not only scored the Stewart-Ford team's first - and so far only - win, but was looking pretty good when compared to the departing Barrichello during the latter part of the season. Herbert, though, became increasingly disillusioned with the whole Jaguar outfit as the 2000 season progressed and announced his intention to retire from F1 in July of that year. He was slightly injured when the suspension on his car broke at the season-ending race in Malaysia, which was a sad ending to a long career. But, in the space of three weeks in September last year, the team announced that firstly they were going to promote their test driver, Luciano Burti, to a full race seat vacated by Herbert for the following season, and then, the signing of yet another total rookie in Tomas Scheckter to replace him as the team's test driver. So, at a time when many mid-field teams were already following the lead of McLaren, and hiring a race-proven test driver to back up the efforts of an experienced pair of race drivers, Jaguar - the team with reputedly the third largest budget on the grid - had two total F1 novices on their driver strength, with a lead driver who was close to his thirty-fifth birthday and who showed little interest in the finer parts of team-building. Indeed it's the 'team-building' element of Irvine's make up that is increasingly coming under scrutiny at Jaguar. The man that hired Irvine from Ferrari, Jackie Stewart, can see clearly just why the Ulsterman has found the move from Maranello so difficult, and he had this to say about his former driver in Melbourne: "It was obviously hard for Eddie to come out of a big team like Ferrari, where the team was geared up for a driver - and not just Michael Schumacher - to do well, because the car was so good. "He has come into a team that was struggling last year to find its pace, and is again this year to a certain extent. Eddie is going to have to find the best way of motivating his mechanics, his engineers and the rest of the team to create what he had at Ferrari in a faster way, because potentially this will be the last team he drives for." A clear message from an F1 veteran that time is not on Edie Irvine's side. No wonder, then, that Niki Lauda moved so fast when it became apparent that the Spanish driver Pedro de la Rosa was not actually signed up by the Prost team as their test driver, and a deal, which included a guaranteed race seat for next season, was quickly done. The word in Melbourne was that Burti has the three 'flyaway' races to prove his worth at Jaguar, or de la Rosa would be in the car for Imola. If that were to happen, then the team will hopefully get what they really want: a driver who can push Irvine hard to confirm just whether he is worth retaining for the last year of his three year deal. If Jaguar is going to be a real force in Grand Prix racing over the next few years, then they really need two drivers who are hungry for success and willing to pay the price to achieve it. In de la Rosa they just might have found one of them, but just maybe a driver under thirty, still with a point to prove might fill the other slot. If things are not going so well for the 'Leaping Cat' on the track, the same can't be said for the way Jaguar road cars are being snapped up from show rooms around the world. Last year their sales were up some twenty percent to just over 90,000 units, and their PR folk are in no doubt as to the role that F1 racing has played in this revival. And, it should not be forgotten, that selling more cars is after all the whole point of the exercise for all the manufacturers entering Formula one, especially if you want to change your image and sell cars to younger drivers. In Mercedes-Benz, Jaguar not only have a great rival, but also an effective role model, showing just what can be achieved by a successful racing programme, allied of course to the right products. In the six years that Mercedes have been in partnership with McLaren, their yearly cars sales have more than doubled from around 500,000 units to over one million. Of course, when you add up just what McLaren-Mercedes have achieved in the last six completed seasons, you get some pretty impressive statistics. 31 pole positions, 32 fastest laps, 26 wins, 74 podiums, 111 points finishes and 574 points scored, not forgetting two World Drivers' Championships and one Constructors'. Jaguar's tally in one season - just 5 points scored in seventeen races - looks pretty meagre by comparison, but so far just being a part of the F1 scene is paying off pretty well. But, just how long will it last if the team continues to under perform? In Bobby Rahal, though, Jaguar have a racing veteran who has both feet firmly planted on the ground and who can at last, perhaps, provide the team with the combination of stability and strong leadership that they so desperately require. All he needs is the time to make his plans work, and in F1, time is always in short supply.